For the past few weeks I have been planning and executing the design for my new banner artwork, which you should now see displayed on the site. * I always knew that the painting on the old site would be a temporary image as, although I am very proud of the work, it doesn’t really relate to what the blog is about. 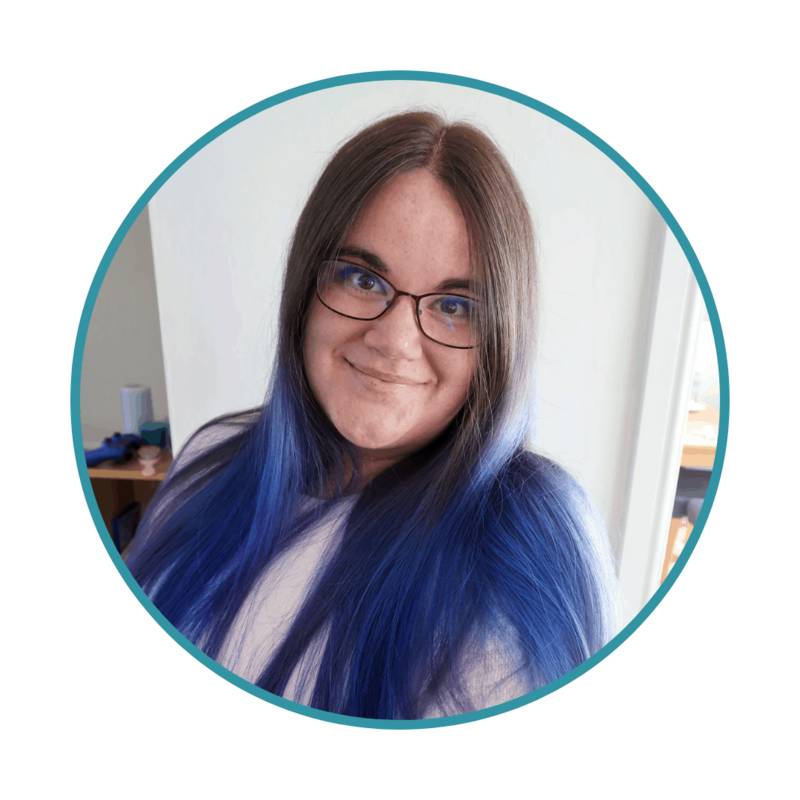 So, when I knew I would be changing to a self-hosted site, I started thinking about the kind of image and text I wanted to represent me and the blog. I was also very keen that I should design and paint the banner myself. Firstly, because I can’t afford to employ a designer – but mainly because I really enjoy painting and an image created by me would be more personal too. Here is a little summary of my process and the thoughts behind the final image. I wanted a simple image and colour scheme with a white background. At first I experimented with images to represent each of my children but I couldn’t find an idea that I was happy with and I found everything I tried seemed to be too cluttered. 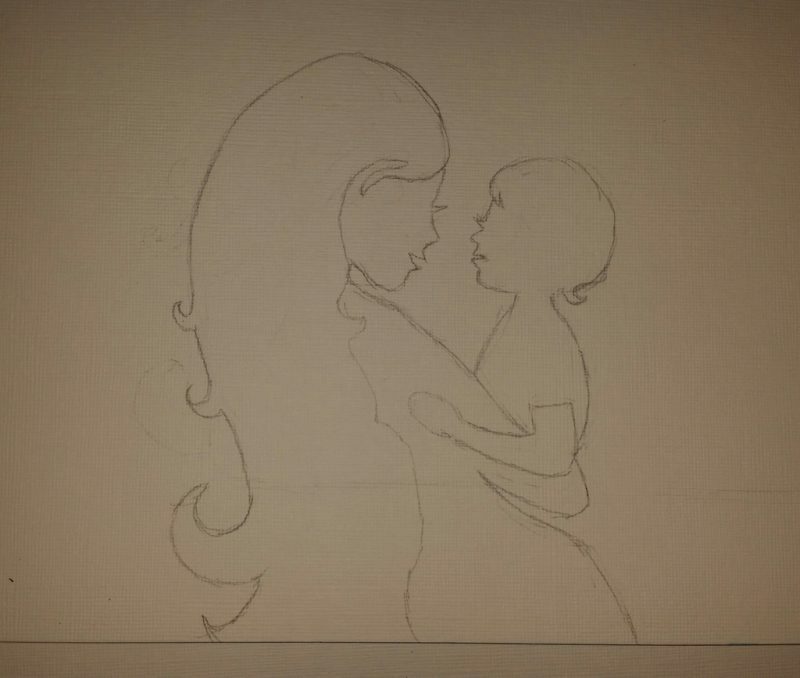 In the end I chose an image of a mother and child but tried to keep the child fairly gender neutral. My daughter has a very cute curl as her hair is growing but my son had a similar kink when he was a similar age – so I intended the child to represent both of them. I also think the age of the child is quite flexible – he or she could be a baby still but similarly they could be an older pre-school child. 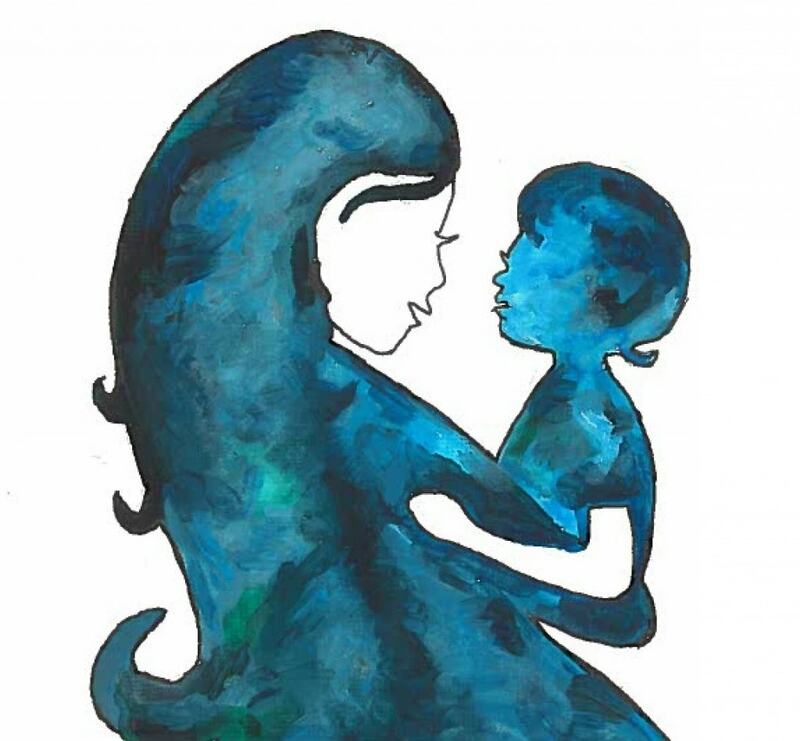 I must admit, the image of the mother is a bit of an idealised version of me. I have a lot of hair and usually keep it very long but that is about where the similarity ends! 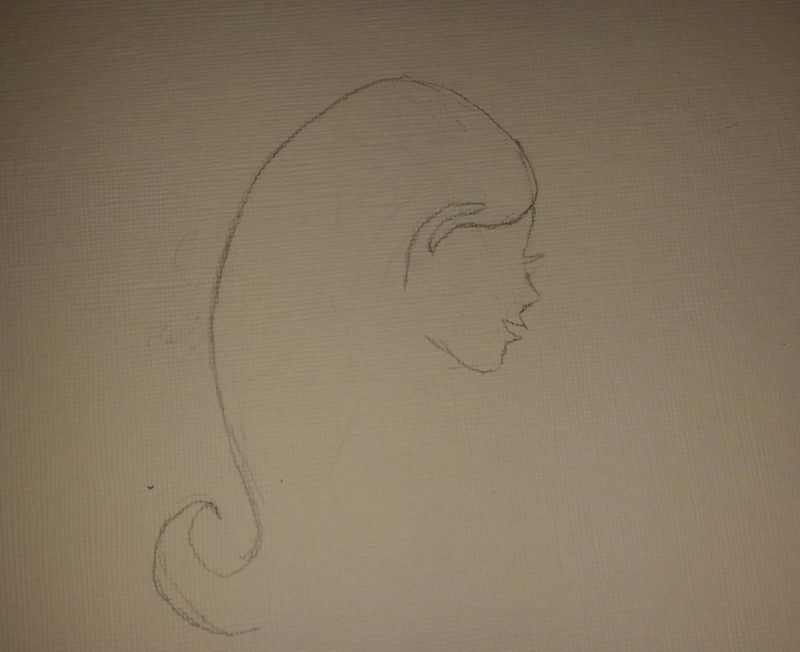 Once I had decidided on the image I wanted and researched some ideas by looking at similar styles of figures, I was ready to start drawing and painting. Note: Old formula bottles make excellent paint pots once you no longer need them! For the text, I simply took a cross section of the colours in the painting. I wanted to keep the colours to a minimum, but still create something where the colour was striking, so I chose a palette of blues, greens and teals. 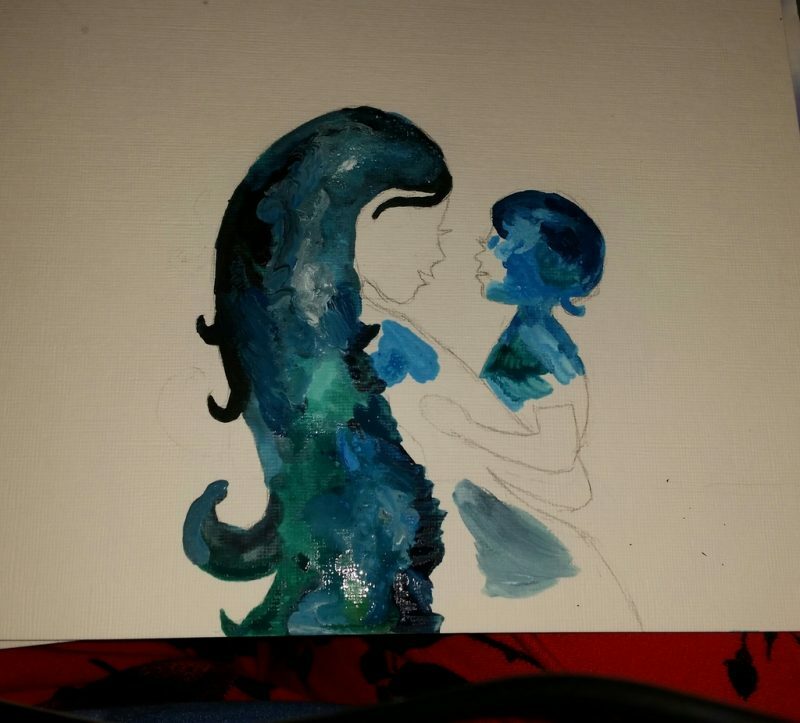 From the beginning, I knew I wanted the colours to ‘bleed’ into one another on my design. This is another reason why acrylics were my choice – they can generate very bold colour while still blending and bleeding between colours. I love the colours and how they all blend together. A very striking banner. great job! My banner is self-made also, but I think yours is a lot prettier! This is so lovely! I saw it on instagram and wished I had artistic ability like this! you are totally right about the colours though, I had no idea it was acrylic that was able to create that effect!! what a fabulous talent and well done! It’s great to improve our blogs one step at a time and lovely to share how we do it! Well done. The art is fab! I think you have done such an amazing job designing the banner I am so jealous as I wish I was that creative too. It’s gorgeous! Very striking and memorable, a real asset to your blog. I’m stunned and impressed that you were able to create this yourself, I’d love to be so artistic. Maybe a future vocational line for you??? Oh this is amazing! I wish I had the time to get back to my artistic hobbies. I use to spend all my time as a teen drawing and writing poetry. Now I barely have time to pee and eat. Wow, you are a very talented artist, I love the new banner! I think it means more that you have deigned it and made it yourself, I wish I had the ability to do that!